Am I the only sucker for an easy and quick pattern? I have a large collection of those patterns, however, constantly finding that they are not as easy and quick as stated on the pattern envelope. What the pattern predicts will take an hour, often times takes me a few hours and sometimes a few days. Butterick 5211: Dress with back neck opening with button/thread loop closure, extended shoulders and topstitching detail is one of them. this dress took me almost a week, despite that the pattern was already cut since I made this dress back in 2009...... ummm yeah . Used a pinkish/lavender printed cotton-poly fabric and after basting with the same sizing and no adjustments, immediately realized... this is likely to be a potential wadder. But then I paused for the cause and knew it could be saved with some adjustments. Pulled out my fisheye dart template and plugged in 2 front darts & 2 back darts, which removed some of the excess ease in the torso area. Scooped out the neckline, omitted the closure detail, reduced the extended sleeve circumference and lastly added front & back neck darts... yes ... this dress has 8 darts. However, the fit was much better, added pockets from New Look 6351 and fully lined. However, there remains a few sticky issues, my darts were not deep enough to remove all of the excess from the front neckline, the sleeve edges are akin to lil airplane wings, and due to the fact that I tinkered with the extended sleeve I lowered the armhole ... yeah armpit cleavage. End result, this dress is wearable, despite the sticky issues. I will go back and add a center dart to the front neckline which is my most irritating issue and if that goes well... I will be happy. After this lil fiasco will it deter me from an easy & quick pattern ... likely not ... I am a true sucker for an easy and quick pattern. I currently have a fast and easy pattern on the cutting table ... so stay tuned. That fabric pattern and colour are so flattering on you. I like quick and easy patterns too but I have come to realize that those pullover woven dresses just don't work for a girl with curves. Your darted dress looks great! 2009 was really nice, but 2015 is really gorgeous! The end result turned out really nice ! Cute dress. What is a fisheye dart template? I like all the adjustments you made. Nice looking dress and looks even more polished with the jacket! Thank you Janie and good question. My understanding is a fisheye/contouring darts allows the fabric to fit and/or shape along our curves. Thank you Linda... I love blazers and most of my makes must work them. You made it work. And the end result is great. I am happy you made it work. It look great on you. Thank you Beverly. After all the pomp & cicumstance it worked out. Thank you Lucy, the dress was a comfortable wear. I would like to try it in a knit... there I go putting another wrench in my sewing. 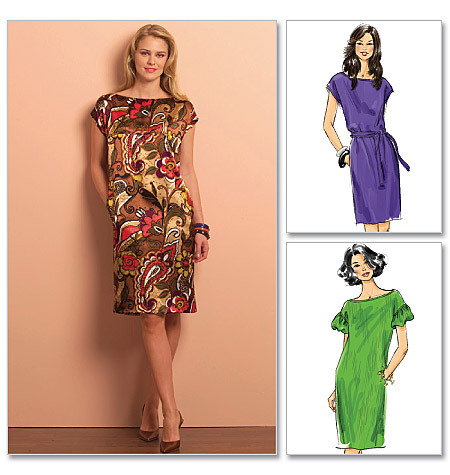 Quick and Easy or 2-hour patterns? sometimes they are and other times they are not. Your choice of fabric made the dress look fabulousssss!